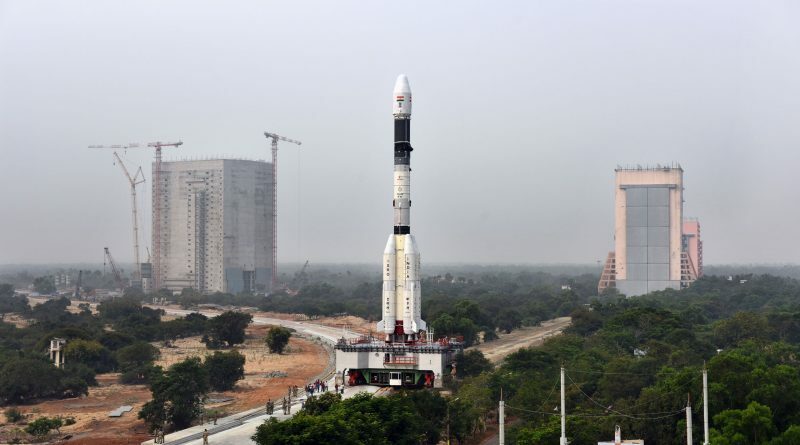 India is gearing up for the country’s second space launch of the year, targeting Thursday to send a Geosynchronous Satellite Launch Vehicle toward a high-energy orbital destination with the GSAT-6A government- and military-use communications satellite. Sporting an upgraded engine on its second stage, GSLV Mk.II is set for launch at 11:26 UTC and will be in action for just under 18 minutes to send the ~2,140-Kilogram satellite into a standard Geostationary Transfer Orbit. 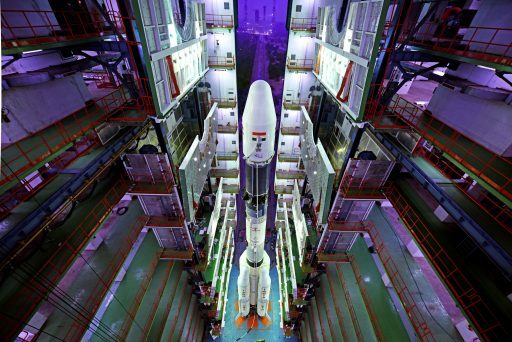 Thursday’s launch will mark the 12th launch of India’s GSLV Mk.I/II launch vehicle family, the sixth of the Mk.II variant with a home-grown Cryogenic Upper Stage and the fifth since the rocket’s comeback mission in 2014 after a major design overhaul. All four GSLV missions since the 2014 return to flight have been successful and the Indian Space Research Organization hopes to keep up this reliability record on Thursday before GSLV will be tasked with the high-profile Chandrayaan-2 lunar exploration mission in October, involving a lunar orbiter, lander and a small rover. India began design efforts in the 1990s to create a launch vehicle capable of launching Geosynchronous satellites while re-using a large number of proven components from the country’s Polar Satellite Launch Vehicle which lacked the performance of lifting a meaningful payload mass into a Geotransfer orbit. The result, GSLV Mk. I, comprised the large solid-fueled core stage of PSLV, four liquid-fueled boosters relying on the proven Vikas engine, a hypergolic second stage also powered by Vikas and a cryogenic third stage procured from Russia. This version of GSLV flew five times between 2001 and 2007 – to mediocre success as only two of the missions reached their target orbit. 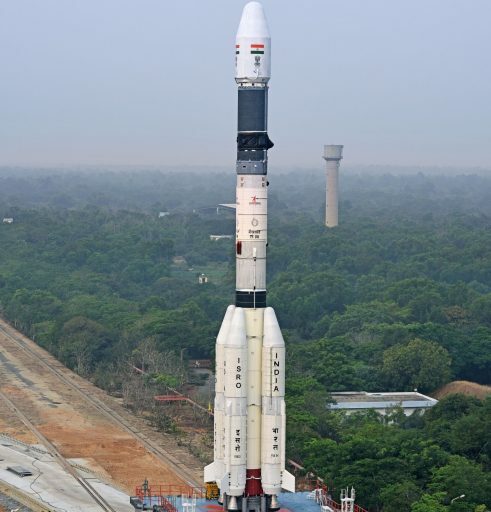 GSLV Mk.II with an Indian Cryogenic Upper Stage debuted in 2010 but failed to reach orbit due to a failure of the Fuel Boost Pump on India’s indigenous cryogenic engine. Another GSLV failure in 2010 sent the rocket back to the drawing board for a top-to-bottom review to identify design deficiencies and create a vehicle capable of satisfying the reliability demands of assured access to Geostationary Orbit from Indian soil. Since its return in 2014 – implementing dozens of changes and reinforcements across the vehicle – GSLV has been flying successfully, lifting payloads between 2.0 and 2.2 metric tons into GTO. With reliability concerns finally alleviated, ISRO has shifted focus on extracting the most possible performance from the GSLV design through an incremental upgrade process that begins with Thursday’s upcoming mission and will continue into 2019 to eventually improve the rocket’s GTO payload capacity from 2.2 to up to 3.2 metric tons. Thursday’s GSLV launch introduces an upgraded version of the Vikas 4 engine serving on the rocket’s second stage, known as the High Thrust Vikas Engine, HTVE. Vikas goes back to a cooperation between the French Space Agency CNES and ISRO under which ISRO provided manpower for the development of the Viking 4 engine for the Ariane 2-4 launch vehicle fleet in exchange for licensing rights of the engine design for its own launch vehicle fleet. 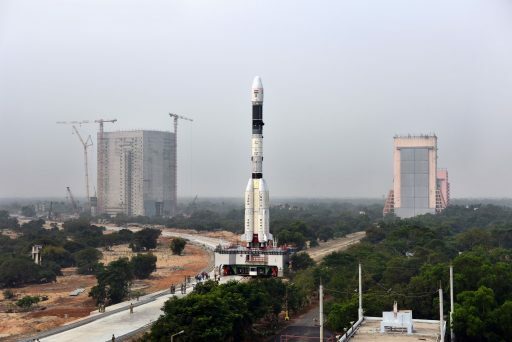 ISRO adapted the original Viking design for domestic production in India, qualified the engine for longer burn times than on the Ariane rocket and went through a gradual upgrade process to arrive at the Vikas 2 and 4 engines flying on PSLV, GSLV and LVM3 today. In 2016, the Liquid Propulsion Systems Center announced it had successfully performed a 20-second hot-fire test of an upgraded Vikas that would eventually become the HTVE – offering a thrust increase of six percent. According to ISRO, the vacuum version of the HTVE flying on the GS2 stage on Thursday will generate a thrust of 846.8 Kilonewtons, up from 799kN for the Vikas 4B through raising its chamber pressure from 58 to 62 bar. Consequently, the engine will burn propellant at a rate of 298 Kilograms per second and reduce the burn time of the second stage by seven seconds. Future performance upgrades planned on the GSLV rocket include the replacement of the Vikas 2 engines on the four L40 boosters with sea-level versions of the HTVE (planned for Chandrayaan-2) and the Cryogenic Upper Stage, currently flying in its CUS-12 variant with 12,800kg propellant capacity, will be upgraded to CUS-15 in 2018 or 2019. Additional performance will be gained through dry mass reduction in various areas of the launch vehicle. 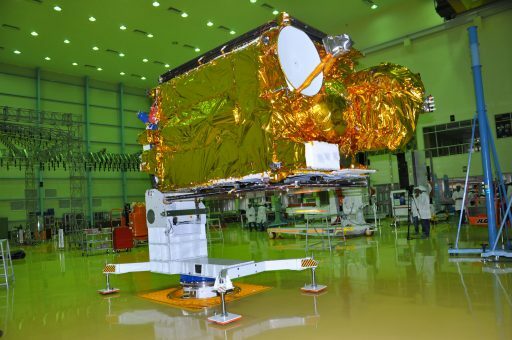 The payload of Thursday’s GSLV F08 mission is GSAT-6A, an advanced S-Band communications satellite built by ISRO to provide capacity for mobile communications for use by the government and India’s armed forces. Joining the similar GSAT-6 launched in 2015, the satellite will provide capacity expansion and continuity of mobile communication services into the mid-2020s. Based on the I-2K satellite platform, GSAT-6A reportedly weighs in at 2,140 Kilograms and targets an orbital position of 83 degrees East, co-located with its sister craft. The satellite is aiming for an injection orbit of 170 by 35,975 Kilometers at an inclination of 20.63 degrees from where it will conduct three large orbit raising maneuvers with a combined change in velocity of 1,656 meters per second to reach a spot in the Geostationary Belt. 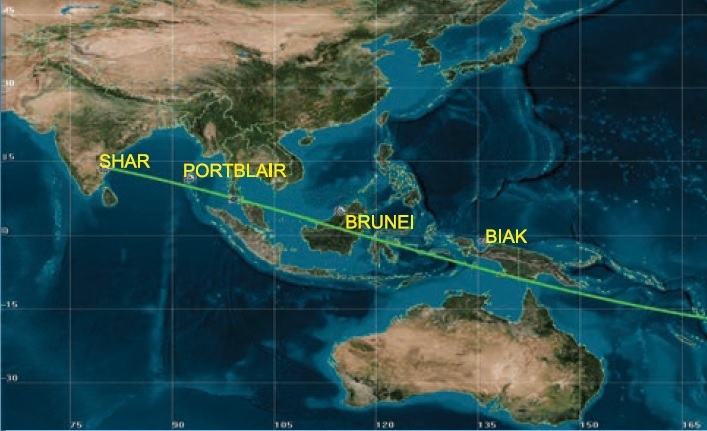 The satellite’s communications package consists of five 9 MHz C x S-Band transponders generating five S-Band downlink beams carrying communications from ground stations to mobile communications terminals while five 2.7 MHz S x C-Band transponders receive the uplink from mobile terminals and route it to a ground station hub. GSAT-6A hosts a six-meter Unfurlable S-Band antenna reflector, the largest such deployable launched by India to date; C-Band hub communications are handled through a conventional 0.8-meter antenna. The 49-meter tall GSLV rocket was rolled from its assembly building to the Second Launch Pad at the Satish Dhawan Space Center last week to enter final launch preparations. A final Launch Readiness Review on Tuesday cleared the rocket to press into a 27-hour countdown operation Wednesday afternoon, starting with tanking activities on the rocket’s four boosters and the GS2 second stage that employ storable propellants while the Cryogenic Upper Stage will receive its dose of Liquid Hydrogen and Liquid Oxygen later in the countdown. GSLV will come to life five seconds prior to liftoff when its four boosters are commanded to ignite followed by the ignition of the S139 Core Stage to lift the 415-metric-ton rocket off the ground with a total thrust of 800 metric-ton-force. Heading east across the Indian Ocean, GSLV’s core stage will consume 138 metric tons of packed solid propellant over the course of a minute and 47 seconds. One of the peculiarities of GSLV is that its core stage burns shorter than the four L40 boosters clustered around it, coming with the drawback of having to drag the dead weight of the core along for another 45 seconds but eliminating the need for four separation events as the L40/GS1 assembly separates as a whole once the boosters shut down. Each burning 42,700 Kilograms of UH25/NTO propellants with their Vikas engine, the four boosters will accelerate the vehicle to a speed of 2.4 Kilometers per second. Separation of GS1 occurs 73 Kilometers in altitude at T+2 minutes and 31 seconds with the GS2 stage firing up its HTVE moments before separation systems are initiated. Tasked with a 132.38-second burn, the 11.6-meter long second stage will accelerate the stack by another 2.5 Kilometers per second before the Cryogenic Upper Stage takes over. 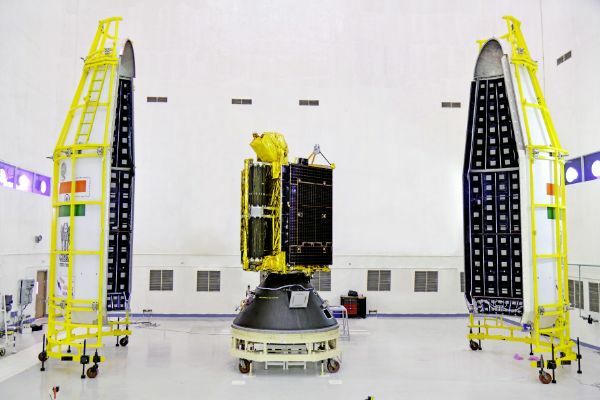 GSLV will drop its 3.4-meter diameter payload fairing three minutes and 45 seconds into the flight when passing through 115 Kilometers in altitude where aerodynamic forces can no-longer harm the satellite. Separation of the GS2 stage occurs at T+4 minutes and 45 seconds and will be followed one second later by the ignition of the CE-7.5 cryo engine on a long burn of 12 minutes and 45 seconds – tasked with increasing the rocket’s speed by almost five Kilometers per second to an injection velocity of 9.7 km/s. 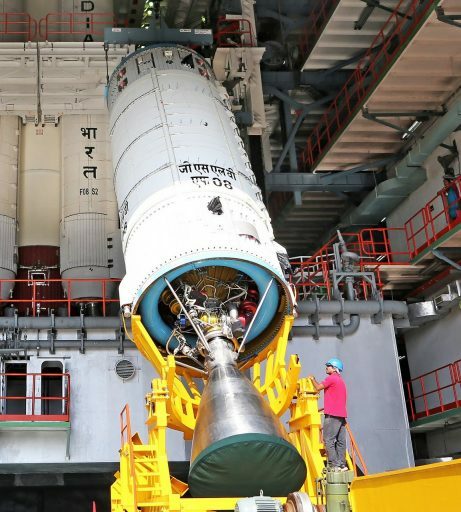 India’s cryogenic stage begins its burn in high-thrust mode providing 9,500kgf of thrust before reducing thrust to 7,500kgf for the remainder of the burn. GSAT-6A is expected to separate from the 12.8-meter long CUS at T+17 minutes and 46.5 seconds, sailing off on a mission of at least ten years delivering strategic communications.